Redd Foxx was born John Elroy Stanford on December 9, 1922 in St. Louis, Missouri. In 1926 his father, an electrician, abandoned the family. Shortly afterward, he and his mother moved to Chicago to live with his grandmother. While in high school he formed a wash tub band with some friends, and called themselves the Bon Bons. In 1939 he and the group train hopped across the Midwest, playing on street corners and in bus stations. They got their first big break when the group appeared at the Apollo Theatre in 1941 on the “Major Bowes Amateur Hour.” By this point Foxx had acquired the nickname “Chicago Red” because of his red hair. He then took on the name Foxx in tribute to the baseball player Jimmie Foxx. Red Foxx married four times. He married his first wife Eleanor Killebrea in 1948, divorcing her in 1951. He then married Beatty Jean Harris in 1955. That marriage lasted 19 years until they divorced in 1974. Foxx married Yun Chi Chong in 1975. They divorced ten years later. Finally in 1991 at the age of 69, Foxx married his last wife, Ka Ho Cho in 1991. Red Foxx got his first job as a solo entertainer at Gamby’s Night Club in Baltimore in 1945. He returned to New York and teamed up with Slappy White. In 1952 the team was invited to open for Dinah Washington. Three years later Dootsie Williams approached Foxx about recording stand-up comedy. While the recordings were never played on the radio because of the vulgarity, they achieved enormous commercial success for that era. Foxx recorded 54 albums which collectively sold over 10 million copies. After Frank Sinatra saw Foxx perform he helped get major appearances in New York, Los Angeles, and Las Vegas. Foxx was one of the first black comics to play before white audiences on the Las Vegas Strip. Hugh Downs saw Foxx in 1964 and booked him on the Today Show, the first of multiple talk show appearances. During the 1960s Foxx was a regular act in Las Vegas. After entertaining a crowd for an hour and forty minutes after Aretha Franklin failed to appear, he was offered a $960,000 contract, a record for Las Vegas at that time. By the 1970s Foxx had played three movies and a number of TV shows. He was best known, however, as the bumbling dad in the 1970s situation comedy, Sanford and Son. Foxx was nominated for six Emmys during the 1972-1977 run of the show. 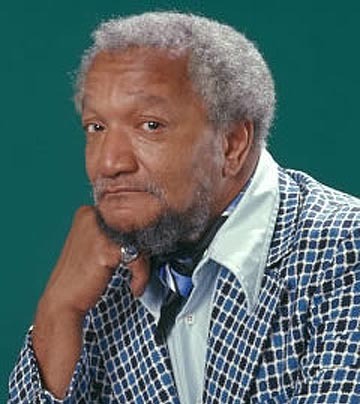 After Sanford and Son was cancelled in 1977, Foxx tried unsuccessfully to continue his career in a short-lived comedy variety show called the Redd Foxx Comedy Hour. By the early 1980s he sank into obscurity. Finally he starred in a 1991 series, The Royal Family, with long-time friend Della Reese as his co-star. The series seemed on the verge of success when he died of a heart attack on the set of the show on November 11, 1991. Redd Foxx will be remembered for Sanford and Son but his greatest contribution to entertainment was his invention of the stand-up comedy album. Redd Foxx and Norma Miller, The Redd Foxx Encyclopedia of Black Humor (Pasadena: W. Ritchie Press, 1977); "Foxx, Red," American National Biography , Volume 8 (1999).